It looks to me really a network issue instead of NAV 2016 one. 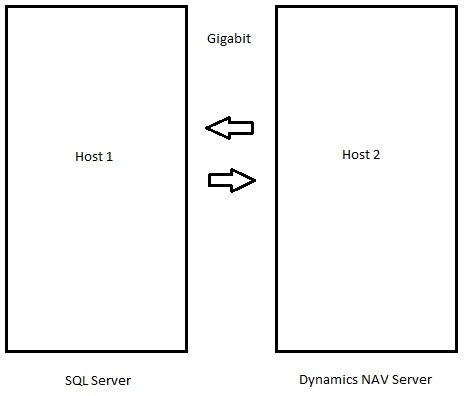 1-The network performance between your NAV Server and SQL Server? 2-Are the two VMs on the same host or different hosts? 3-The IO speed on disks used on the NAV Server? (disks on SQL Server seems to work perfectly as your workaround resolved the problem). If you have a chance to go throw these areas please share your comments back. We thought it was the network issue. But NAV 2013 was working under the same environment without performance issues. According to their IT administrator, they ran diagnostics on their network and everything checks out. We have also had problems with virtual machines but not the problem you described but it could be the same anyway. Forgot to mention that we did a standard technical CU upgrade 2015, CU4 to CU23 and had to do a complete rollback after four hours. This bad performance on two separate virtual servers occurs primarily, if the VMs are overloaded, i. e., if for example the physical machine has 16 CPU cores and each virtual server has been allocated 10 cores. The reason behind the resulting wait times is, that a VM is only working in time intervals, where all allocated CPUs are available. CPU overcommitment is a real drama, like explained bij G. Hübner. Having both SQL Server & NAV Server on the same host is a hughe improvement because the physical network layer is never addressed. Network traffic in such case is performed in memory. Yes, I totaly agree with proposed suggestion. The network latency is mission critical for SQL – NAV virtual environment. We could achieve from as low as 1000sql commands/s to approx. 5000sql commands/s from middle tier to data tier. That’s transatction response ratio of 10-times. We always test this parameter before production. Someone knows if NAV 2017 and NAV 2018 have the same issue? Yes, same issues applied to future versions. You refer to them as separate hosts, but the vm host should be the physical server running hyper-v (or whichever virtualization software you use); that hosts all of the VMs inside of it. Did you mean that the SQL server and NAV app server were running on separate VMs and they needed to run on the same? You can have separate physical servers running multiple VMs. I’m saying the VMs for SQL and NAV needs to be on the same host on one physical server.